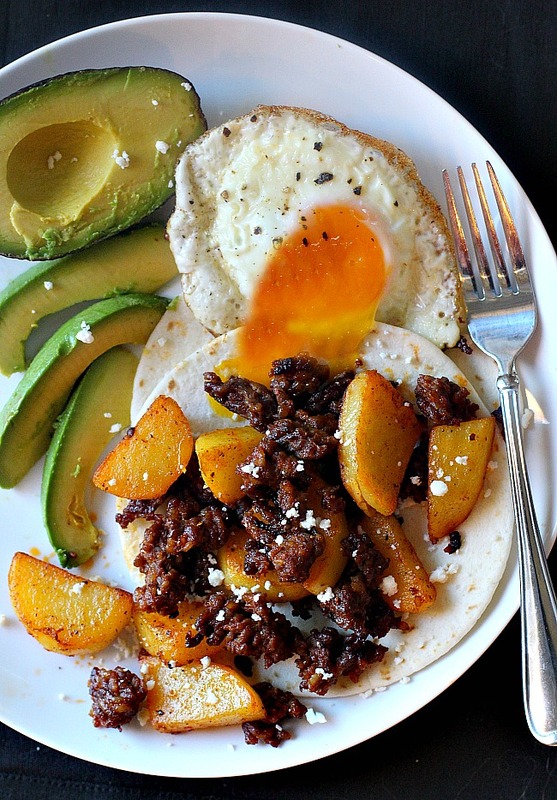 These Chorizo Breakfast Tacos are super easy to make and flat-out delicious. Tacos aren’t just for dinner. Chorizo, crispy potatoes and over-easy eggs are simply THE best way to start out your day. 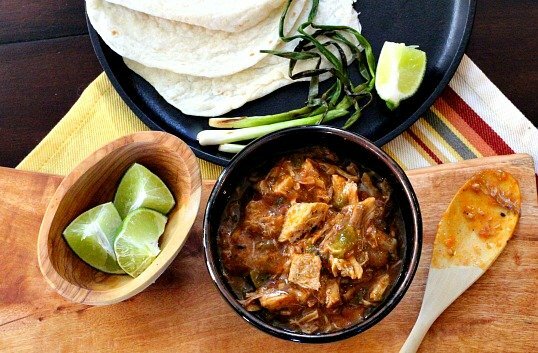 Bold epic flavors, with a soft steamy flour tortilla, you’ll want to make these over and over. Actually about anything you want. 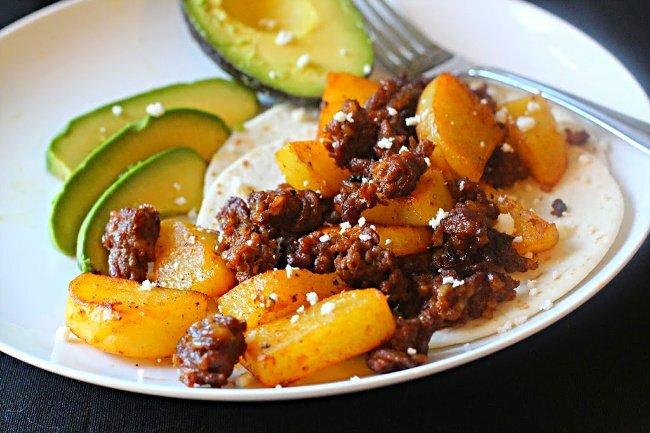 However, our favorite and simple way to make a breakfast taco is to brown bulk chorizo sausage, cube and crisp some potatoes, and your taco is bursting with flavor and texture. All you need is a warmed flour tortilla, some sliced avocado and a fried over-easy egg and you’re enjoying a very flavorful breakfast taco. After all, tacos aren’t just for dinner. The fried potatoes for these chorizo breakfast tacos become infused with flavor by first browning the chorizo in your non-stick fry pan. With a slotted spoon remove the chorizo to a plate. Add the potatoes to the same fry pan that you cooked the chorizo without removing any of the flavored fat from the sausage. Most of the sausage I buy leaves just enough fat, a tablespoon or so. If you have purchased chorizo that leaves a large amount of grease in the pan, drain all but 1 – 2 tablespoons. Then fry the potatoes. When I refer to bulk chorizo, it resembles a package of ground beef. You an also buy tubes of chorizo where the meat is more finely ground and the fat content is way to high for my taste. Stick with bulk sausage. Make sure your potatoes have been cubed small enough to cook through in a manageable amount of time. If you like larger cubes, (pictured above) boil the cubed potatoes for about 8 minutes, drain, pat dry and then add to the fry pan to cook through and crisp them up. I recommend Yukon Gold potatoes. 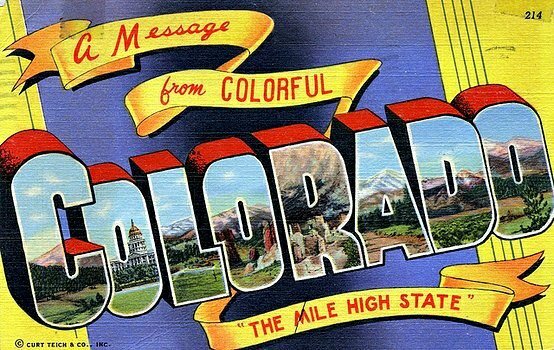 We like their color, texture and flavor. 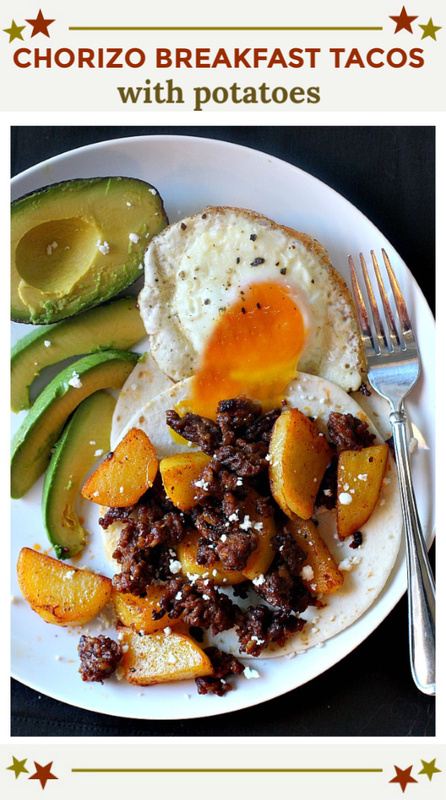 Once you try these Chorizo Breakfast Tacos, you’ll want tacos for breakfast on a regular basis. Here are some more ideas for Breakfast Taco fillings. Breakfast sausage, potatoes, jalapenos, …. and if you’re looking to add taco seasoning, homemade is always better. 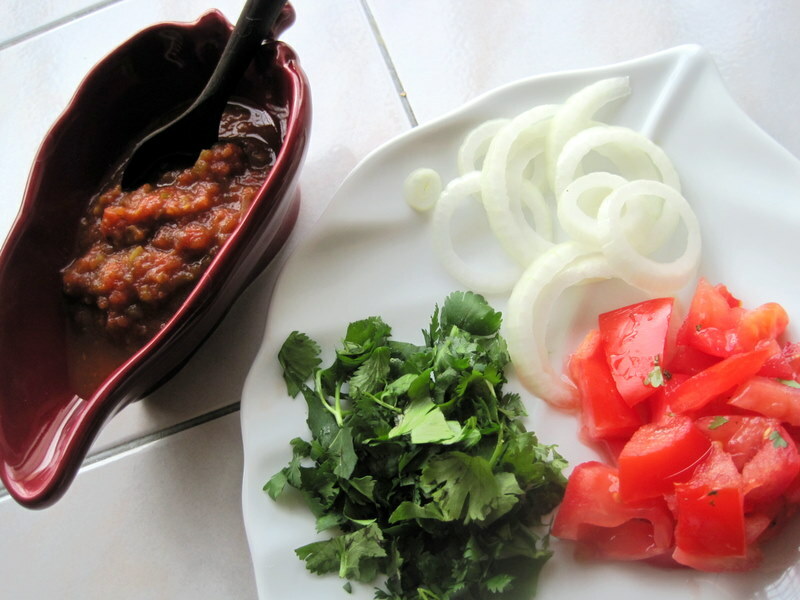 Take a look at my recipe for Homemade Taco Seasoning. 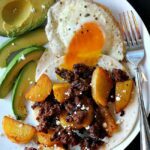 I hope you give these Chorizo Breakfast Tacos a try, and if you do, please come back and give the recipe a star rating. And leave a comment about your experience with these breakfast tacos. And if you have a favorite chorizo breakfast recipe, please let me know, I’d love to give it a try. Peel and cube the potatoes. Place potatoes in a sauce pan and cover with salted water. Over medium high heat, bring the potatoes to a boil and cook for 8 minutes. Drain the potatoes and pat dry. Heat a non-stick fry pan over medium high heat. Once the pan is hot, crumble in the bulk chorizo. Cook until browned. With a slotted spoon, remove the chorizo to a plate. Add the partially cooked potatoes to the same fry pan and cook until crispy and cooked through. This should only take about 5 minutes. Add the cooked chorizo and gently stir to combine. Remove to a plate and tent to keep warm. With a paper towel, wipe out the fry pan. Spray the pan with PAM and cook the eggs. Slice an avocado. Warm 2 flour tortillas in the microwave for 30 seconds. To serve, spoon potato and chorizo mixture onto a warm tortilla. Serve with sliced avocado and fried eggs. Sprinkle with Mexican Crumbling Cheese. Looking for other South of the Border Breakfast ideas? How about this open-faced Toast with Smashed Avocado, Bacon and Fried Egg. From the archives, this is one of my favorite breakfasts. 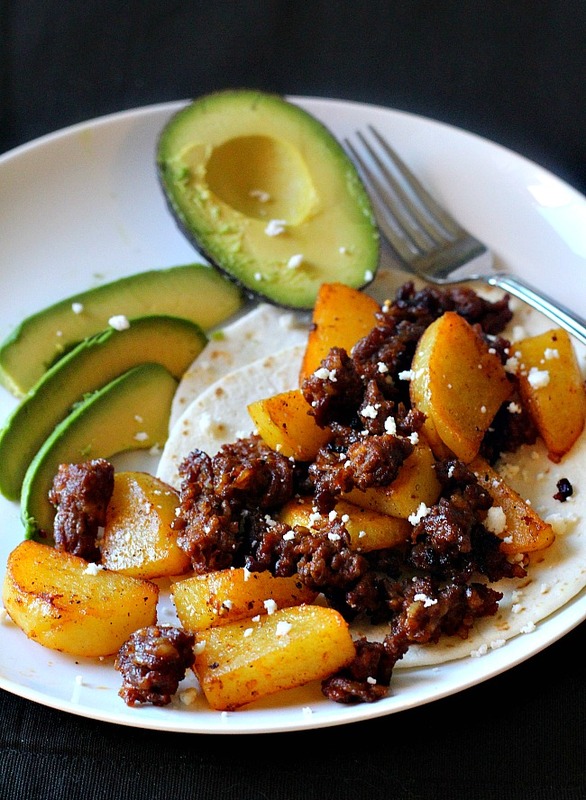 Chorizo Breakfast Tacos …It’s What’s For….well…..Breakfast.